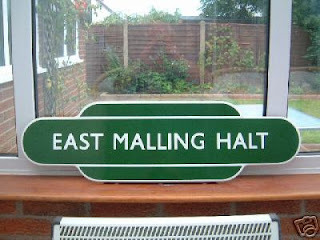 Another ebay auction has resurrected the East Malling Halt theme that started back in March (see my original and subsequent post). The item is a East Malling Halt totem sign. The seller described this as a "rare totem", which was reflected by the fact the winning bid was £450! Some totems on ebay have apparently sold for £2000, so maybe £450 is a bargain. I have included the photo the seller left below.